New Issue of Perfect Sound Forever--DJ Jeff Jupiter Interview! The new issue of Perfect Sound Forever is now online at http://www.furious.com/perfect/. You'll find my interview of Austin DJ Jupiter Jeff in the latest Vinyl Anachronist column. 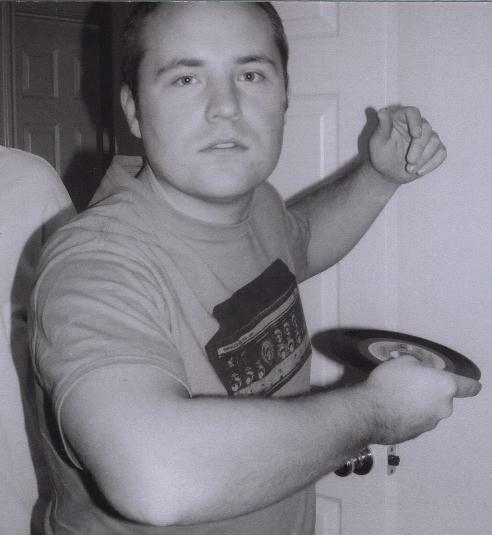 Jeff's a turntablist who has a rather interesting musical pedigree--his father is John Ike Walton, the original drummer for the 13th Floor Elevators. Today was a cold, dreary, wintry day in Austin. Just last week we were basking in temps that approached 80 degrees, and today we're freezing our butts off. The weather seemed perfect for the outdoor gig at the Liberty which featured all-Portland bands. More than one musician joked about bringing the Portland weather with them to Texas. I came to see Jon Ragel, aka Boy Eats Drum Machine. This is about the fourth or fifth time I've seen Jon, but the first time since leaving Portland last year, and the first since he released his new album Hoop + Wire. The new songs are more fluid and more accessible than the songs from Booomboxxx (one of my favorite LPs), and a little less exotic and angular. I purchased both the LP and CD before I left and listened to the CD on my way home. I'll review it when it sinks in a little more, but I like it. I also watched the set from another Portland band named World's Greatest Ghosts, and I enjoyed them as well. I fell in love with the female bassist--she's the epitome of every cute Portland girl I've ever seen. In other words, she was pale, wore glasses and was a true thinking man's beauty. Her name is Emily Laney. She looks like an Emily. The promo pic below doesn't do her justice. But there she is. Wow. 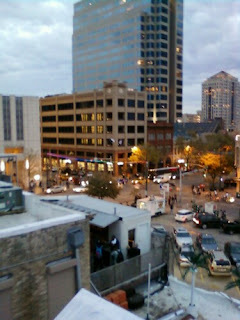 My first night at SXSW was pretty exciting...I just kept darting into clubs, hearing great bands, darting into more clubs, over and over. I discovered during the course of the night that I really like Shiner Bock, an amazing factoid considering I lost my taste for beer a few years ago. Too bad the Bud Light Girls showed up at the Speakeasy and tried to take my Shiner away and replace it with their swill. They were hot, but not that hot. I settled into the Speakeasy for a few hours because I wanted to see DJ DUS perform a set. I went all the way to Corpus Christi last month to attend the opening of PRODUCE, his retail space/gallery/DJ academy, but he was acting as host and didn't really perform. Thanks to Dus, I really like cumbia (or, as he says, CUMBIA! ), and I found myself hypnotized for the entire hour he was mixing. Every few minutes I'd unleash a goofy smile because I was constantly surprised by his musical choices. 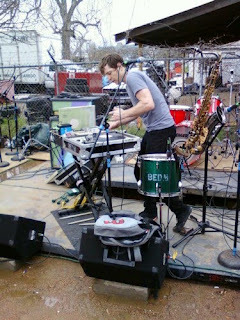 He was also backed up by live percussion via members of the Peligrosa All-Stars, who followed after Dus left the stage. After Dusty's set, I managed to finally meet Jason Gross, founder and editor of Perfect Sound Forever. I've been writing for Jason since 1998, and this is the first time we met in person. Hell, it was the first time we even spoke on the phone! He'd just seen Smokey Robinson and was still in a daze. After all these years, Smokey can still put on a great show. Jason and I are meeting for breakfast Sunday morning...maybe there won't be a line for blueberry pancakes at the Counter Cafe. Tonight I'm going to see DJ DUS again at the Speakeasy, and then tomorrow I'm going to meet up with Jon Ragel of Boy Eats Drum Machine at the Liberty at 1pm. He's promised me some vinyl! Not a great way to start my first SXSW. A friend of mine here in Austin said that Big Star was set to play this weekend. I got to interview Jon Auer (part of the latest Big Star lineup, the Posies and a genuinely interesting solo artist) last year, and he had nothing but great things to say about Alex. RIP, Alex. You were a true original.